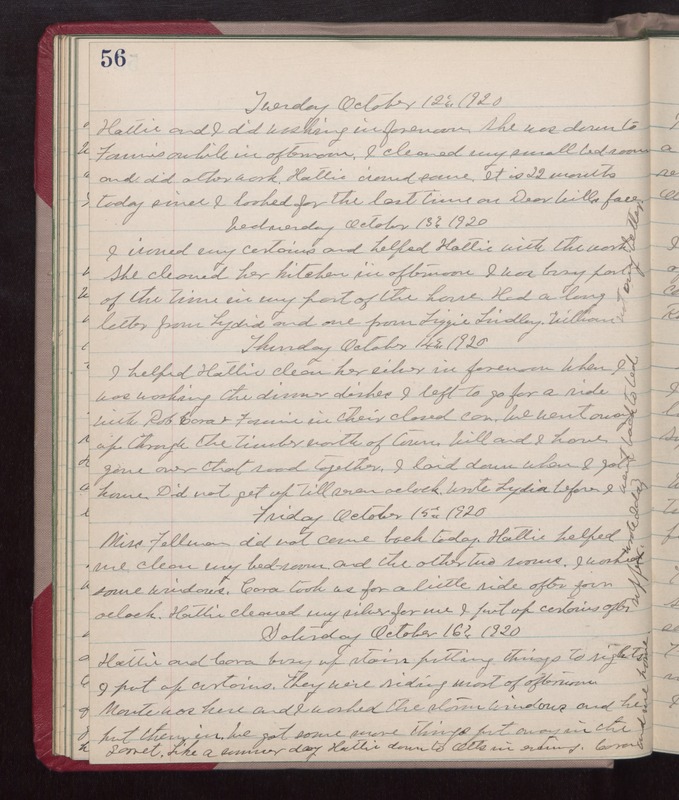 Tuesday October 12th 1920 Hattie and I did washing in forenoon. She was down to Fannies awhile in afternoon. I cleaned my small bed-room and did other work. Hattie ironed some. It is 22 months today since I looked for the last time on Dear Wills face. Wednesday October 13th 1920 I ironed my curtains and helped Hattie with the work. She cleaned her kitchen in afternoon. I was buys part of the time in my part of the house. Had a long letter from Lydia and one from Lizzie Lindley. William not any better. Thursday October 14th 1920 I helped Hattie clean her silver in forenoon when I was washing the dinner dishes I left to go for a ride with Rob, Cora & Fannie in their closed car. We went away up through the timber north of town. Will and I have gone over that road together. I paid down when I got home. Did not get up till seven oclock. Wrote Lydia before I went back to bed. Friday October 15th 1920 Miss Fellman did not come back today. Hattie helped me clean my bedroom and the other two rooms. I washed some windows. Cora took us for a little ride after four oclock. Hattie cleaned my silver for me. I put up curtains after supper. wrote Ida. Saturday October 16th 1920 Hattie and Cora busy up stairs putting things to rights. I pout up curtains. They were riding most of afternoon. Monte was here and I washed the storm windows and he put them in. We got some more things put away in the garret. Like a summer day. Hattie down to Otts in evening. Cora and me home.